This recipe calls for one of my all thyme favorites Cherryland’s Best. Dried Cherry Berry Mix. This super mix is a blend of dried cherries, cranberries and blueberries. Cherry Berry Mix can be used in just about everything and should be. Cherryland’s Best is a family owned Wisconsin company. 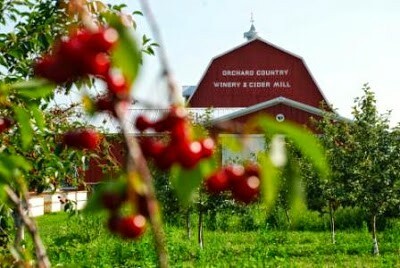 It began making Door County Cherry Juice products in 1944 and has been producing cherry products ever since. Door County is well known for its white sandy beaches and beautiful sunsets. Door County is as picturesque as a New England postcard. Well known for producing delicious wines and the legendary fish boils made with whitefish from Lake Michigan. 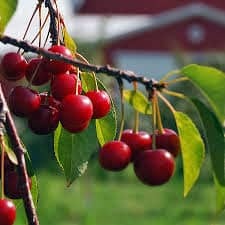 Door County is also known for being an excellent place for growing Montmorency (tart) cherries. If at all possible, plan a “field trip” to Door County in the spring. Then you can see all of the beautiful cherry trees in bloom. 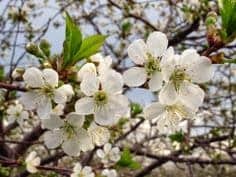 It’s a beautiful sight to behold on a warm spring day when the sweet scent of cherry blossoms fills the spring air. Then again, the fall is a beautiful time to visit Door County. With it’s fall festivals and pumpkin patch parades, you can’t go wrong, but then summer is a great time too! Take a walk on the shores of Lake Michigan or discover all the lighthouse that dot the shoreline. 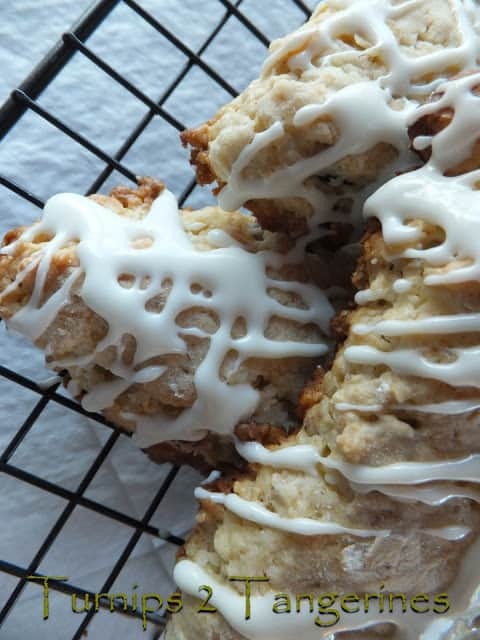 If you are a fan of any and all things lime like I am, you will love these simple scones. The flavor can’t be beat but to pump up the volume a little, serve these already delicious scones with lime curd. Oh yeah! Now you can make your own lime curd, I certainly won’t stop you but you can do what I do and keep a jar or two of lime curd at all times. Just in case the scone urge hits you and you don’t have any limes to make lime curd with. Delicious served warm of cold. Heat oven to 400º Line baking sheet with parchment paper. In large bowl, stir together flour, oatmeal, sugar, salt, baking soda, and baking powder. Cut in cubed butter with a pastry blender. In small bowl, stir together cream or milk, egg and lime zest. Add to flour mixture. Stir. Add dried cherry berry mix and stir just until combined. Turn dough out onto a floured surface, knead 8 to 10 times. Pat dough into a circle, cut into 8 to 10 wedges. Place wedges on parchment lined baking sheet and bake for 12 to 15 mins. In a small bowl whisk together confectioners' sugar, french vanilla coffee creamer and lime juice. 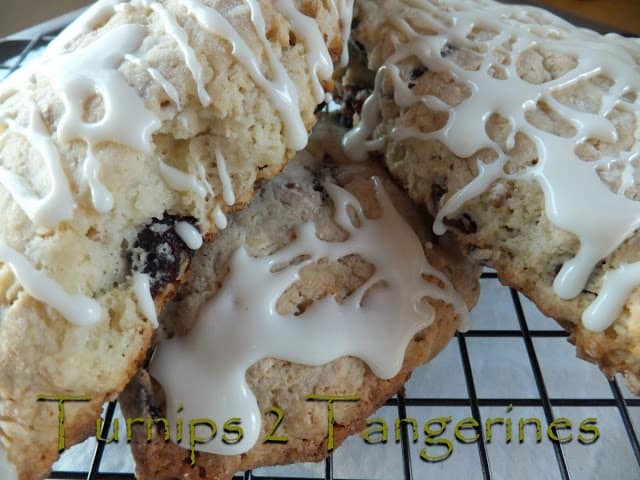 Drizzle over warm scones. Thank you Evelyn:) See you at Freedom Fridays Blog Hop! Sounds like a really nice flavor combination for scones. And they do make me think of Spring. Thank you for stopping by my blog. Those do look really delicious! I'm your latest follower.